This photo shows a sports day or fun day on the Daisy Field. We have no more information on this photo. It looks like the 1970s by the fashion. Was you there or your children on the day? There are lots of happy faces ………………do you know any of them? L/R Martin .Kevin .Roy Rixson. Maureen Rixson .Ian Davidson.Lynn Davidson. Eddy Archer. Middle of photo Sharon Archer ( Bundock ) Jimmy Bundocks daughter and Terry Archer. Yeah it’s official name is King George V playing fields as are so many (471 of them to be precise) in honour of the death of King George, they were given to the nation for sports and the likes in 1936.
can someone please tell me why the daisy field was called the daisy field as ive been told the original name may have been king george v playing fields. I dont recognise anyone in the photo, but this must have been taken after 71/72 because the high rise flats in the background were not built until then. . This fun day was possibly held in aid of something. And I can recall three things. . . The Broadway Estate fun day held to help raise funds for the Adelaide Road Jubilee Street Party 1977. . (or for the Stephenson/Gainsborough Ave one). . A Tilbury Playscheme sports day 1977/78. 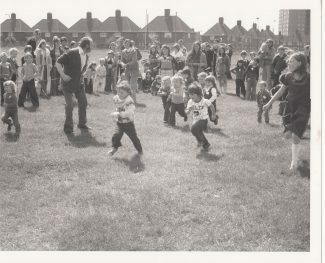 Or a fun day held by the Tilbury Majorrettes to raise funds for their new uniforms so they could parade in the 1975/76 carnival. . . Of course, I may be wrong on all counts!! Thanks Larraine, I know the fun days for the Broadway were usually held on the green in the flats but you may be right!